Compact modelling multi-effect pedal processor with a highly visible tuner that features 158 types of amps and effects powered by “REMS” modelling technology, seven of which can be used simultaneously. It also provides 100 rhythm patters including a metronome, and 200 preset programs that include numerous stage-ready song preset programs, plus 200 editable user programs that can be saved. Four program memory buttons allow one-touch recall. Automatic tuner features an easily readable LED meter and backlit LCD screen for excellent visibility, even in dark environments. Processor provides an aux input for connecting MP3 player with dedicated aux pitch function that allows adjustment of the pitch of the audio input in a range of +/- octave, and a sturdy die-cast body. Multi-function foot switch can also be used to switch program memories. Sound editor software that allows creating sounds and managing programs can be downloaded from the Korg website. DC 9V power supply allows easy integration with the pedal board, but the unit will also operate on USB bus power for hassle free integration with the computer. Dimensions: 70 x 123 x 48 mm. Weight: 511 g. Cool Black colour design. 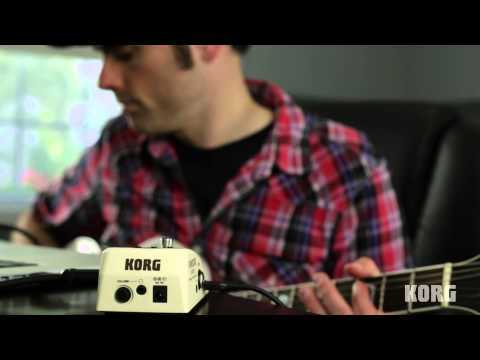 Do you own Korg Pandora Stomp BK or have you had a chance to try it? Zvuky jsem tam našel pěkný ale nepodařilo se mi sjednotit hlasitost,tak šel z domu. Nagyon sokat tudó kis cucc, ne tévesszen meg a mérete. Jó ár/minőség arány.